WHEAT, LEATHER SEAT TRIM, MOONLIGHT WHITE, [L92] CARPETED CARGO MAT, CARGO NET & FIRST AID KIT, [H01] THEATER PKG -inc: dual 7" color monitors, (2) wireless headphones, wireless remote control, aux audio/video input jacks, 120V pwr outlet, heated second-row outboard-seats, remote tip-up second-row seats, [B93] STAINLESS STEEL REAR BUMPER PROTECTOR, [B92] ROOF RAIL CROSSBARS, Vehicle security system w/alarm, Vehicle dynamic control (VDC), Tuscan Burl wood trim, Traction control system (TCS). 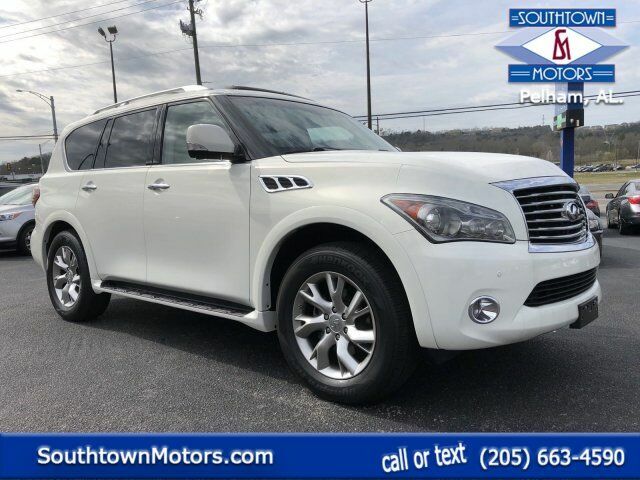 This INFINITI QX56 has a dependable Gas V8 5.6L/339 engine powering this Automatic transmission. Tinted pwr sliding moonroof w/sliding sunshade, Three-row roof-mounted side impact curtain airbags w/rollover sensor, Sequential welcome lighting, Self-leveling rear suspension, Roof rails, Rear wheel drive, Rear privacy glass, Rear glass defroster w/timer, Rear air conditioning w/rear controls, Pwr tilt/telescopic steering column w/steering wheel memory, Pwr rear liftgate, Pwr folding heated pwr mirrors w/integrated turn signal & mirror memory -inc: reverse tilt down feature, puddle lamps, P275/60R20 full size spare tire w/aluminum wheel, P275/60HR20 all-season tires, Leather-wrapped heated steering wheel w/illuminated multi-function controls, LATCH (Lower anchors & tethers for children) system, Keyless ignition w/push button start, Intermittent rear wiper w/washer, Integrated towing receiver class IV hitch w/7-pin wiring harness plug, Integrated front/rear splash guards. Live a little- stop by Southtown Motors located at 2841 Pelham Pkwy, Pelham, AL 35124 to make this car yours today! We have Guaranteed Credit Approval! Do you see your next vehicle? Go to southtownmotors.com and click on "Apply Online" to get the process started! Don't forget to ask about our First Time Buyer program! Let us show you how easy it can be! Disclaimer: **All Prices are inclusive of a $1000 Trade Allowance and a $1000 Finance Allowance*Price excludes tax, tag, title, and any other fees* See dealer for details.